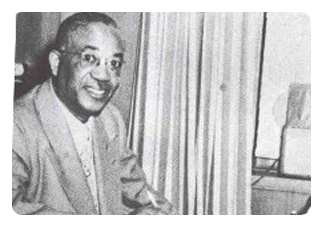 Birmingham businessman and entrepreneur A.G. Gaston (1892-1996), was one of the most successful African American business owners in Alabama. Overcoming humble beginnings and racial discrimination, Gaston built a $40 million empire with an emphasis on diversified ventures. Arthur George (A.G.) Gaston was born in Demopolis, Ala., on July 4, 1892, to Tom an Rosa Gaston. After his father’s death, Gaston’s mother worked as a cook for A. B. Lovemen, founder of the state’s largest department store. When Gaston was 13, he and his mother moved to Birmingham with the Lovemans. Shortly after arriving in Birmingham, Gaston’s mother enrolled him in the Tuggle Institute, a privately run charitable school for African Americans, which adopted Tuskegee’s Booker T. Washington’s message of self-initiative in skilled trades and business. Washington, who periodically made speeches at the Tuggle Institute, became Gaston’s role model. Inspired by his messages, Gaston grew restless and left the Tuggle Institute, taking odd jobs before enlisting in the military. After returning to civilian life, Gaston opened the Booker T. Washington Burial Society which helped to make funerals more affordable for African Americans. He later established the highly successful Booker T. Washington Insurance Company, offering life, health, accident, and burial insurance, as well as undertaking, casket manufacturing and sales of burial plots. Gaston continued to expand his empire. Seeing a shortage of black clerks and typist, he opened Booker T. Washington Business College. He added the Vulcan Realty and Investment Company, the A.G. Gaston Home for Senior Citizens, WENN-FM and WAGG-AM radio stations, S & G Public Relations Company and the A.G. Gaston Motel. He also opened Citizens Federal Savings & Loan Association, the first black-owned financial institution in Birmingham since Alabama Penny Savings Bank 40 years earlier. At the age of 94, Gaston again added to his empire by starting the A.G. Gaston Construction Company in 1986. Although Gaston was not an outspoken advocate for Civil Rights, he supported the movement in many ways. He encouraged his customers to save money and register to vote. He managed to get the “Whites only” signs removed from fountains in First National Bank as a result of privately threatening to close his account with the bank. He provided a job to Autherine Lucy which gave her financial support to become the first black student to register at the University of Alabama. He provided space for Dr. Martin Luther King, Jr. and Rev. Ralph David Abernathy at low rates to plan their protests. He also posted bail for Dr. King after his arrest in the Birmingham campaign. Gaston’s motel was bombed in 1963, as well as his home. Gaston died in 1996 at the age of 103.